U.S.S. Missouri (BB-63) is one of the world's most famous ships for several reasons. Most importantly, on September 2, 1945, Missouri served as the ship on which Allied and Japanese representatives signed the formal document of Japanese surrender after a brief speech by General Douglas MacArthur. Missouri, one of four Iowa-class battleships, was the last battleship built to completion for the U.S. Navy and was commissioned in June 1944. One of the most famous photographs of the Pacific War, which was taken in April 1945 during the Battle of Okinawa, shows a kamikaze Zero fighter about ready to crash into the ship as gun crewmen take cover. President Harry S. Truman considered battleship Missouri to be his ship, since he came from Independence, Missouri. He took a 12-day vacation aboard the ship with his wife and daughter when he returned from Brazil in September 1947. All four Iowa-class battleships came out of mothballs in the 1980s, and Missouri was the last battleship afloat in service until her decommissioning in March 1992. The famed battleship has served since 1999 as a museum ship at Pearl Harbor. This first-rate hardcover book tells the long history of Missouri and her crew with words and photographs in such an expert way that both historians and general readers will be fascinated. Author Paul Stillwell was director of the U.S. Naval Institute history division at the time this book was published in 1996. He has authored or edited several Naval Institute Press books including Battleship New Jersey: An Illustrated History (1986) and Battleship Arizona: An Illustrated History (1991). In Battleship Missouri: An Illustrated History, he sets a standard for thoroughness in research for a ship history. He conducted personal interviews with over 100 former crewmen and used almost 20 other interviews from an oral history project. He attended two reunions of the U.S.S. Missouri Association, and he rode on Missouri to Hawaii in late 1991. The bibliography indicates that Stillwell also utilized numerous books, magazine articles, newspaper articles, and official records to put together this well-documented history that includes 15 pages of notes that specify sources for the book's stories. 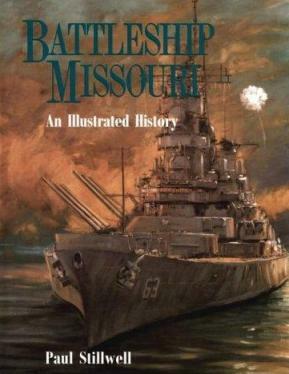 Fifteen chapters tell Missouri's history in chronological order with a 30-page appendix providing a complete chronology of dates for the ship's movements. Another appendix provides key ship data and detailed line drawings showing the outboard profile and overhead view as outfitted at different dates during Missouri's service. This appendix has various other drawings of the ship including an inward profile that displays various numbered compartments with a key at the bottom that gives over 100 names of different ship sections. The back of the book includes a detailed index. The many photographs found throughout the book have thorough captions. Japanese kamikaze pilots generally preferred to target wooden decks of aircraft carriers rather than try to attack heavily armored battleships. Despite this, battleship Missouri got hit by two kamikaze aircraft during the Battle of Okinawa, but they caused negligible damage and few casualties. On April 11, 1945, a bomb-carrying Zero fighter struck the starboard hull just below the main deck level. The bomb did not explode, and the crash cut the pilot's body in half with the top half ending up on the main deck and the bottom half going into the water along with much of the plane. The right wing landed on the ship and caused flames with black smoke that were quickly extinguished. One paragraph describes how the classic photograph was taken by Seaman Len Schmidt a moment before impact of the wing against the starboard hull began the disintegration of the aircraft. A short funeral was held the next day for the Japanese pilot, and his body was buried at sea. On April 16, 1945, another Zero fighter attacked Missouri and clipped a guard rail at the top of the fantail airplane crane. The Zero exploded in Missouri's wake, and debris from the plane sprayed the fantail and caused two injuries to crewmen. The numerous personal stories included in this history run just the right length. They provide enough details to depict incidents and personalities, but they do not digress from Stillwell's main purpose of presenting a comprehensive history of battleship Missouri. For example, seven pages tell the story of the September 1947 cruise from Brazil with President Truman and his family aboard Missouri. This section has some memorable photographs including one with President Truman leading morning calisthenics with a shirt that reads "Coach, Truman Athletic Club" and another one with his daughter Margaret eating with the crew. During the cruise she joked with Captain Dennison that she knew more about the crew than he did because she ate meals with them. She had christened the ship U.S.S. Missouri three years earlier at the commissioning ceremony in June 1944. Another memorable episode is the controversy caused by Cher's skimpy clothing during the filming of her music video for the song "If I Could Turn Back Time" aboard USS Missouri at Long Beach Naval Shipyard on July 4, 1989. The book includes a photo with Cher in her distinctive outfit and with Missouri's two three-gun turrets of 16-in. guns in the background. Paul Stillwell's clear writing style, extremely thorough research, and skillful integration of historical photos with text make Battleship Missouri: An Illustrated History a superb ship history. U.S.S. 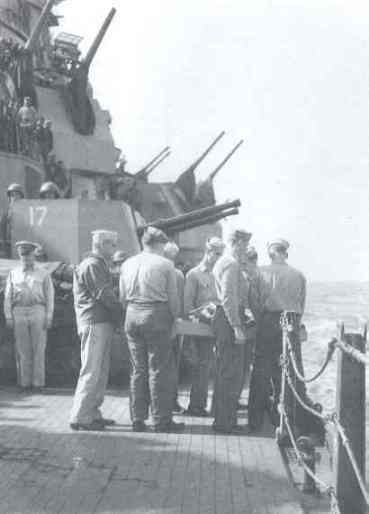 Missouri crewmembers prepare to bury the corpse of the kamikaze pilot at sea. It takes up only a portion of the wooden slab because the bottom half of the pilot went down with the airplane following impact.